All of these St. Patrick’s Day recipes look absolutely delicious! 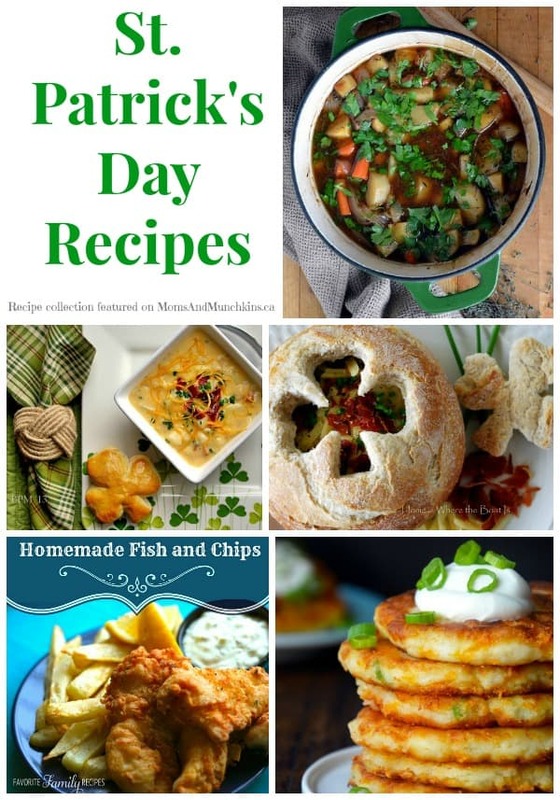 This is a collection of recipes all from different writers so you’ll want to click on the title of each recipe to be redirected to the full post with the recipe details. These St. Patrick’s Day recipes are perfect for small family meals, potluck celebrations or even a big St. Patrick’s Day feast! I have a feeling that some of these delicious recipes will become new family favorites in your home! Let’s kick this off with a recipe you’ll find here on Moms & Munchkins! 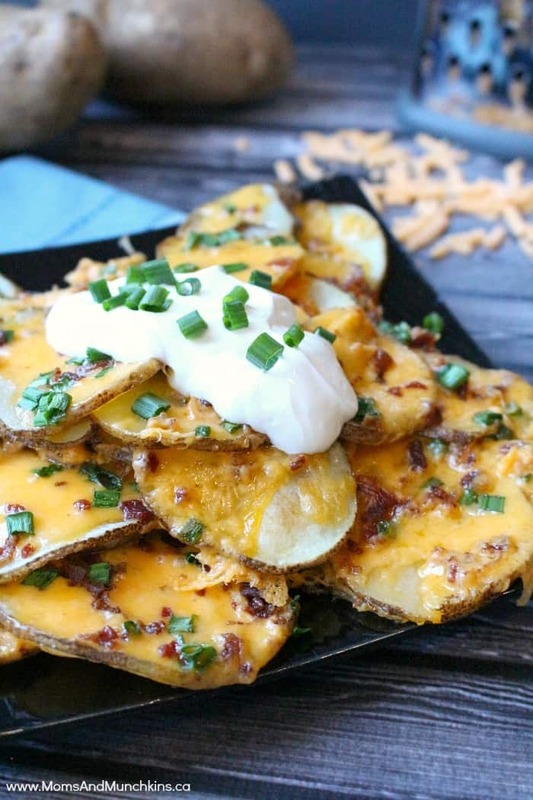 This Loaded Baked Potato Nachos recipe is so popular that it was featured in Woman’s World magazine! 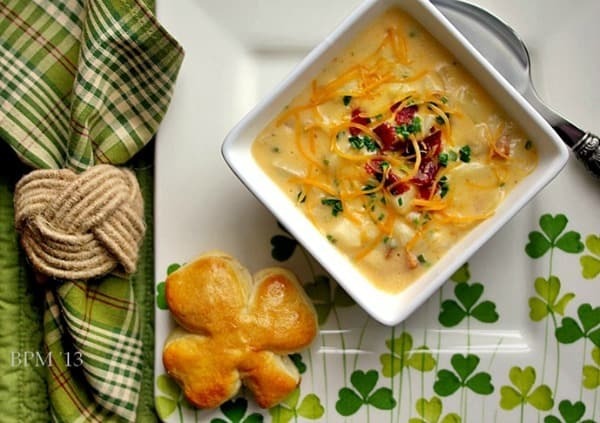 Not only does this Pot Of Gold Irish Potato soup by Home is Where The Boat Is look perfect for St. Patrick’s Day but it looks absolutely delicious too! 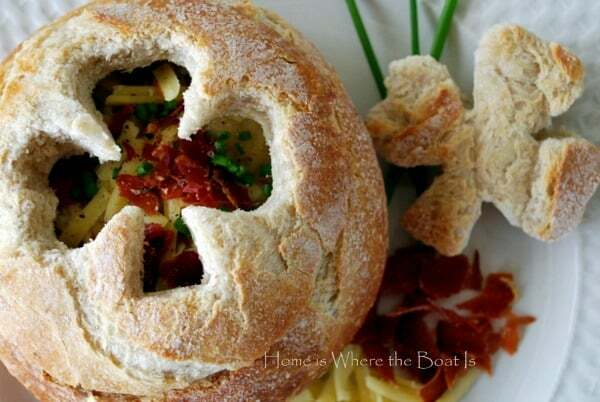 Have you ever tried eating soup in a bread bowl? It is so good! 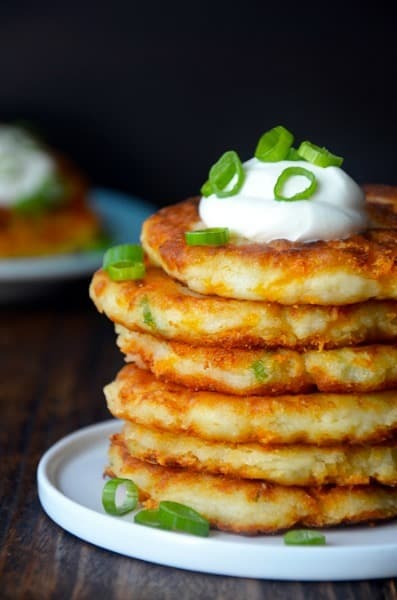 One of my favorite Irish dishes is potato pancakes…but I’ve never tried any that look as delicious as these Cheesy Leftover Mashed Potato Pancakes on Just a Taste. 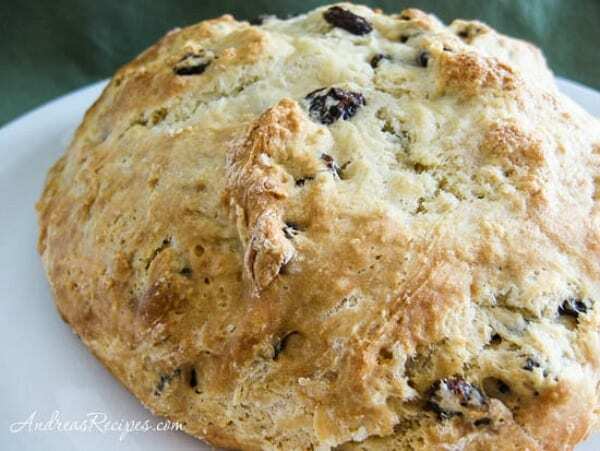 I have a weakness for bread and this Irish Soda Bread by Andrea Meyers looks so delicious! It would go great with a warm bowl of Irish stew! This Irish Stew by The View From Great Island looks like a delicious comfort food on a cold day. This Slow Cooker Bacon Potato Chowder by Back Porch Musings is another comfort food that looks perfect for a cold day. I love the shamrock biscuits on the side! 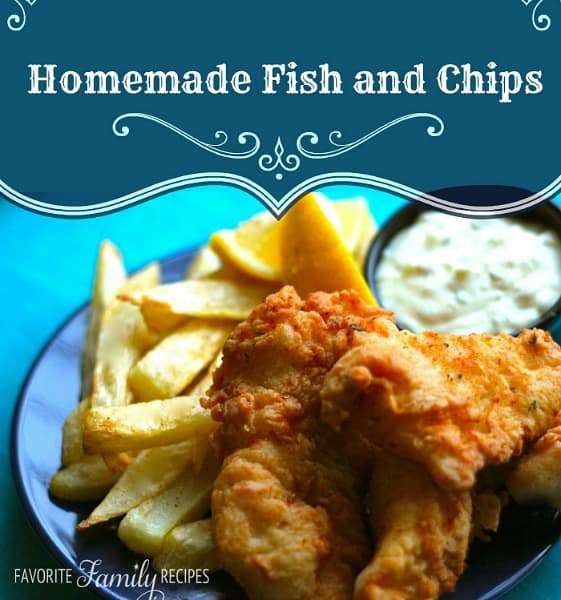 I’m not a big fan of fish or any kind of seafood but this homemade fish & chips dish by Favorite Family Recipes looks delicious. This is a meal I know my husband would gobble up quickly! For more delicious ideas for St. Patrick’s Day, visit our St. Patrick’s Day page. We have loads of dessert ideas, free printables, party ideas and more! Thank you to everyone who agreed to share their recipe here with us. We’re always adding new ideas for holiday entertaining. Never miss an update by following us on Facebook, Twitter, Pinterest, and Instagram. Everything looks wonderful! Thanks so much for putting together this beautiful and delicious post. Thank you for sharing, Pat! Your dish looks so delicious! Thanks so much including my Cheesy Leftover Mashed Potato Pancakes! What amazing company to be in! Thank you for sharing, Kelly! My tummy is still growing for some of those potato pancakes! Thanks for including my Irish Stew, Cheryl — I love your line-up! Thank you for sharing, Sue! 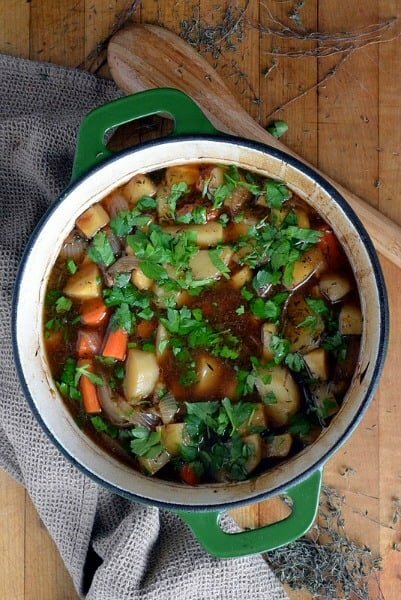 Your Irish Stew looks delicious! Hi! Do you have a recipe you usually go off of for the mashed potatoes for the potato pancakes? Looking to make them for a party. Hi Katie! If you click on the link for the mashed potato pancake recipe, you’ll see all the details there (the recipe was submitted by another blogger). Thank you!